Many people seem to be unfamiliar with what opiates or opioids are, even if they have unknowingly taken a legitimate opioid prescription in the past to recover from a medical procedure. Opiates are a class of drug that’s derived from opium and bind to the opioid receptors in the brain. Opiates include a host of common prescription drug medications including names like Vicodin and OxyContin, and also include generic terms like morphine, codeine, hydrocodone, heroin, and morphine. When an addiction to opiates comes to mind, the automatic association for many people tends to heroin and needle injections. While this is a tragic public health crisis that desperately needs more attention, what everyone needs to know is that all opiates harness great potential for physical and mental addiction – just because they’re legal, prescription drugs administered by a pharmacy does not mean that there are no repercussions for misuse or abuse. Now, we don’t want to outright condemn the use of opiates. Opiates are useful in legitimate medical circumstances where one is going through great deals of pain. 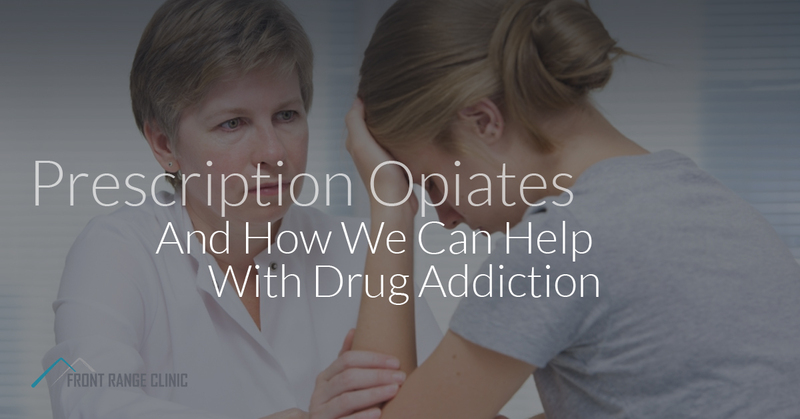 Opiates help make the pain bearable that countless patients deal with, but oftentimes, these patients exit their recovery period addicted to opiates. Using opiates as a recreational party drug can also lead one down a dark path, but regardless of your relationship with opiates, the team at Front Range Clinic is here to help with drug addiction for those in need. Our judgment-free health practice provides a safe space and a healthy environment for heroin recovery or other types of recovery from addiction. Front Range Clinic offers Opioid Dependence and Suboxone Maintenance Therapy services that will help you stop using opiates in general, whether they are legal prescriptions or illegally-sourced. Suboxone, or Buprenorphine/Naloxone, is a medication that has proven very successful in helping people quit heroin and other prescription opioid medications. Combined with our therapy services and surveillance, Front Range Clinic is prepared to help you through your battle with addiction in a loving and supportive manner. Addiction is a vicious cycle, and depending on your home environment, it can be almost impossible to break the chains on your own. That’s why our effective addiction recovery programs will help you work through heroin recovery and into a sober, healthier and more fulfilling life that we believe everyone deserves. For Northern Colorado’s best addiction recovery center, look into Front Range Clinic to see how we can help you. Contact us today.